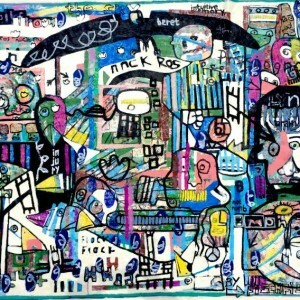 Jonas Fisch is an emerging artist who was born in Sweden, and currently lives and works in Los Angeles. 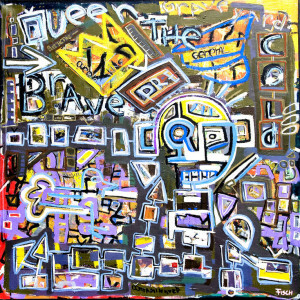 His vibrantly colorful abstract paintings are inspired by street art and renowned artists such as Jean-Michel Basquiat and Jackson Pollock. 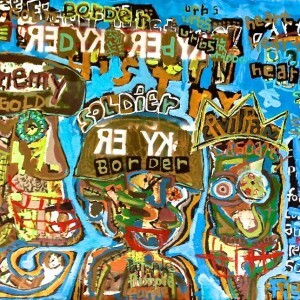 He places word and imagery upon canvas; the juxtaposition supplies the viewer with sharp commentary upon society. 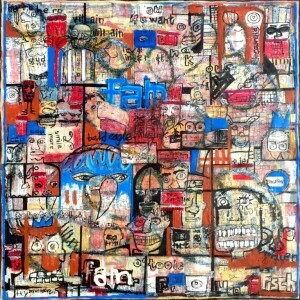 Furthermore, by combining figure, word, and shape within one canvas, he aims to express his innermost thoughts and feelings. 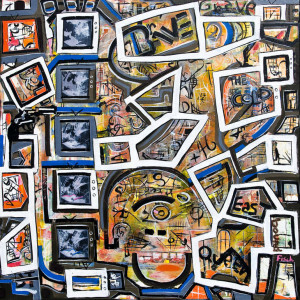 Jonas exhibits extensively at multiple galleries in Los Angeles, including Gallerie Sparta, Westmore Lofts, 533 Gallery, and Gallery Godo. My subconscious has a big influence on my work. Sometimes it’s past or present events that’ll become vibrantly buzzing commentary on society morphed into figures, words, and shapes. Other times it’s personal experiences and emotions that’ll flood my mind and drip onto the canvas. I try and not judge or censor what comes up, but at a certain point, it’s like the painting takes on a life of its own and reveals itself. It’s the point of no return and I have to paint it, whatever it is. There’s a Swedish saying that goes, “Your taste is like your bum. Divided.” So the best advice I’ve received is to dare to be myself, both in art and in life. Music is a big inspiration when I work because it stirs emotions within me, which in turn can affect my brushstrokes, as well as the shapes and colors I use in my works. It’s a draw between Jackson Pollock’s Guardians of the Secret and Jean-Michel Basquiat’s Notary. I love how they’re both filled with interpretative clues that either veil or reveal differing levels of meaning that sometimes need to be examined separately before one can arrive at an understanding of the whole. I’m very drawn to the jazz-like riff and rhythm of Jack Kerouac. There’s a quote from On The Road which I just love: “The only people for me are the mad ones, the ones who are mad to live, mad to talk, mad to be saved, desirous of everything at the same time, the ones that never yawn or say a commonplace thing, but burn, burn, burn like fabulous yellow roman candles exploding like spiders across the stars.” I’m also a fan of playwright David Rabe and his metaphorical long-winded prose and satirical characters with big words, prone to talking jags. It’s really funny.